Well, we're here! Apparently I'm really good at writing posts and then taking long breaks, but we've had a pretty good excuse. 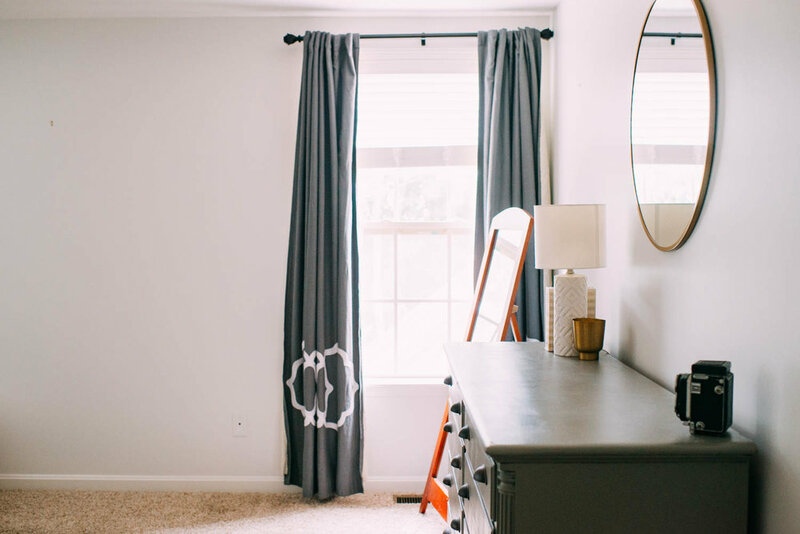 We are all moved in and settled at our brand new home, and with as many questions as I've had for our master bedroom and furniture and decor used, I thought now was the perfect time to share with y'all. I loved our bedroom in our first home. It had three giant windows that overlooked a beautiful park, and the natural light was to die for. The first thing that I noticed when we walked through our new home, was that the master was beige. It's not that beige is bad [it's not!] it's just that it isn't me. I take a LOT of lifestyle photography in our bedroom, as well as boudoir, and I'm trusted by a lot of people and clients to use the space to produce great photos. So, the day after we moved in, our trusty painter came early in the morning and got started. He used Sherwin William's Snowbound, and three coats later, it looks exactly as I had dreamt it would. I wouldn't call the room 'complete' by any means. But it's at a great point that I can show you what we've done thus far, and I'll continue to update you as time goes on. High on my next must have, are matching and modern lamps. The one on the left is an antique Aladdin lamp that my dad has had since he was in his twenties; the one on the right is my great grandmothers. Both are beautiful, but I think they could be used elsewhere in the home (once we get new ones). The photo above was taken shortly after our Golden Elsa was home from minor surgery. She had a wart and small tumor removed (ouch!) and she was so tired, I decided not to finish making the entire bed. Ha, I'm a sucker for these fur kids. Anyway. Let me show you some more! We had a house warming party this weekend (yesterday!) and so many people said, "You bought a new dresser" when they walked in our bedroom. Nope!! We didn't. We've had this dresser our entire marriage, it's been in my husband's family forever. Before we moved out of our first home, he said, "What if we painted it with the exterior paint that's here?" At first I was skeptical, first of all, the paint was pretty old (probably a big no no in professionals worlds?) but I am thrilled with how it turned out. We purchased new knobs from Lowe's, and their finish is just beautiful. The round mirror is something that I have wanted for years. Thank God for Instagram and the saving ability; I have had SO many photos saved of this mirror and as soon as the bedroom was painted, the rest of the room just started to flow. It's a Target find, of course, and I went to two different stores across town just to get it. It's currently 5% off now and you can get it online, so for all you who've asked, grab yours quick! The I Choose You print is completely custom and from Dear Lily Mae. The quote is near and dear to my heart, and means a lot to my husband and I. We have it tattooed on our arms, so having it over our bed just made perfect sense. The curtains we actually switched with Reese, they used to be in her old room. I love how the gray and white simple design goes with the space. The bedding currently on the bed is from Boll and Branch, by far one of the greatest companies I've been blessed to partner with. The duvet is so soft, (Elsa clearly agrees) and we love using it. Currently the room is simple, yet elegant, which is exactly how I had envisioned. I think there's some room to tweak and re-arrange, and over time we may get some accent chairs for some extra sitting space. Every day I wake up and open the curtains and my heart is so happy. My husband hung a hummingbird feeder and bird feeder on the deck which is right outside one of the windows, so often while I get ready I see my new bird friends enjoying their treats. It feels like home, and I feel abundantly blessed.